As expected, Northern Fleet Chief of Staff and First Deputy Commander, Vice-Admiral Vladimir Ivanovich Korolev (Королёв) officially replaced Vice-Admiral Aleksandr Kletskov as Commander of the Black Sea Fleet on 2 July. Turning 55 next month, Kletskov retired on age grounds, but, as only Kommersant bothered to note, Korolev turned 55 in February, so President Medvedev has either officially extended his service a couple years, or plans to give him another star, allowing him to serve to 60, under the law. About Korolev’s background . . . after finishing officer commissioning school in 1976, he was assigned to a Northern Fleet nuclear submarine, serving as a division head in the navigation department. According to Kommersant, in the mid-1980s, he served in the Gadzhiyevo-based 24th Division of Submarines (24th DiPL). He eventually served as executive officer and commander of Victor II-class (proyekt 671RT) SSNs K-488 and K-387. He completed mid-career Higher Specialized Officer’s Classes in 1987. In 1993, he became Deputy Commander of the 24th DiPL, and completed his advanced education at the Kuznetsov Naval Academy in 1995. He then moved to the Northern Fleet’s Operations Directorate as chief of an unidentified department, then chief of fleet ASW. By August 2000, he was Commander of the 24th DiPL, and in 2002 became Commander of the Sayda Guba-based 12th Squadron (24th and 18th DiPLs). 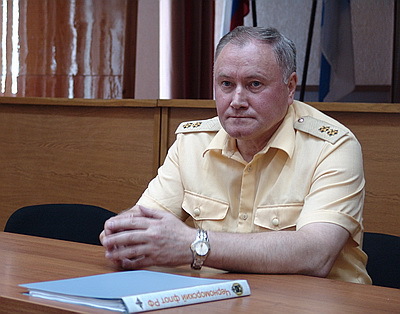 On 19 November 2007, Korolev became Deputy Commander of the Northern Fleet, and was appointed Chief of Staff and First Deputy Commander in August 2009. Media reports haven’t mentioned whether he’s married or has children. Korolev faces a large number of unresolved military and social issues in his fleet. It has an extremely high percentage of old ships that aren’t combat capable. Some problems with Ukraine persist despite the recent improvement in relations and the Kharkov agreement extending Russia’s Crimean presence to 2042, as well as the promise of 15 new ships and submarines which followed it. An anonymous BSF staff source told Novyy Region Korolev’s first task is to replenish the fleet with new ships, not just secondhand Baltic Fleet units. His second job is placing orders for repair and construction of ships not just at the BSF’s 13th Factory, but at Ukrainian shipyards as well. The fleet’s social problems are next. It has hundreds of officers whose duties were eliminated, but they can’t be dismissed since they don’t have apartments. The source says these guys are walking around in uniform, but have no jobs. Korolev’s fourth task is a related one–returning Moscow Mayor Luzhkov to full engagement in Sevastopol. Luzhkov is no longer building apartments there as he has in the past owing to a dust-up with the Defense Ministry over the handling of property in Sevastopol. Lastly, Korolev has some real naval missions to worry about like securing southern energy routes, the 2014 Winter Olympics, antipiracy operations, and keeping a Russian presence in the Mediterranean. Regarding Admiral Vystoskiy’s promise of new ships and submarines for the BSF, Moscow Defense Brief analyst Mikhail Barabanov told Kommersant the civilian and military leadership may see the fleet’s reinforcement a priority because it may more likely see real combat action than the Northern and Pacific Fleets. A Kommersant BSF staff source describes Korolev’s main mission not as planning for new ships by 2020, but simply supporting the combat capability of a fleet contracting before our eyes.